Alas the rascal that seems to reserve the same books I am reading, thus preventing a renewal so this will have to be short and sweet. You laugh, but I think I can do it. We were drawn to collaborate on this book out of a common sense of love and heartbreak. Love for our country, heartbreak for what is happening to it. . . . Our grand 240-year-old project of self government has been derailed, replaced by a coin-operated system that mainly favors those who can pay to play. This is not what our American predecessors bled for, not just during the Revolution but during other wars, as well as during money moments of protest and resistance. 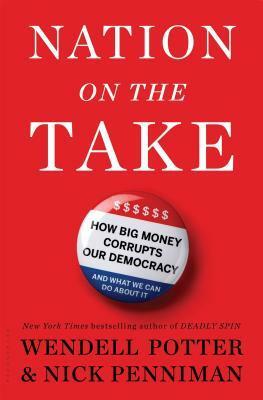 Some of the chapter titles show a little dark humor as well: Oligarchy, Gridlock, Cronyism for chapter 3; Too Big to Beat for 4; Fuel Follies 6; Fat Wallets, Expanding Waistlines 7; and more. An easy guess on the “Expanding Waistlines” is the problem of obesity in America. The book is full of details about things, for example, the amount of money by the “beverage” industry lobby increasing from $22 million to $58 million. And points out that contributions increased as well.